My husband and I have been married 11 years. In that time, we have lived in 5 states and have had 8 addresses. You’d think we’re in the military with all that moving, but no! We have often worked in the defense industry, so maybe it’s not all that different. If we want (or need) to find a new job, that often means looking at a different company, in another state. We started off getting no company-provided relocation to being offered a comprehensive relocation package for our last move. We’ve learned what to ask for and what to be careful about. Let’s face it, long-distance moves are expensive! 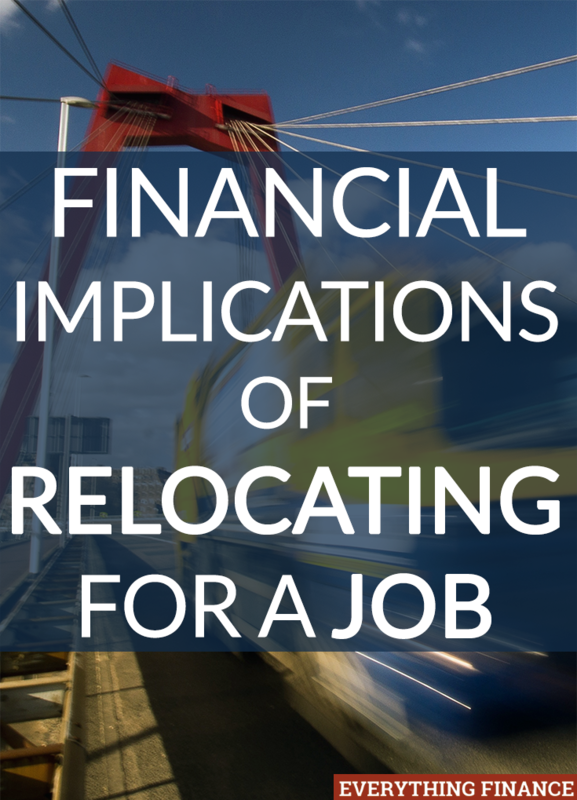 Whether your employer is paying for the move, or you are, here are some considerations on the financial implications of relocating for a job. When considering moving to another city or state, the first thing you need to look at is the cost of living comparison. You can find several good tools online (I’m personally fond of tools that allow zip code comparisons). But even if you’re using a good tool, you should be careful with that data. We have used the online calculators for a couple of moves with mixed results. For our last move, we noted that the cost of living was a teeny bit higher, but we weren’t terribly concerned. I even accepted a pay cut in the process. We thought we’d tighten our belts a little and probably come out ahead. We moved to the area, started looking at homes, and that’s when the cost of living hit us. The average home price was similar to the average home price where we moved from, but the problem was the condition of the homes. We had moved from a Houston suburb, where many of the homes were less than 20 years old. We moved to a place that was overwhelmed by 100-year old homes. Many of the homes still listed asbestos and lead pipes in their disclosures. The amount of work that the homes needed meant that we couldn’t afford as much of a mortgage payment. While the online calculators are a great start, you should use extreme caution when using them. Look at the biggest line items in your budget and do additional research. Assuming you press ahead with the new area, you should start researching salaries before you ever get an interview. Use payscale.com to generate a report on the salary you should be earning, based on your experience and the area. Research the company and position title for pay reports on glassdoor.com. Make sure you can get an acceptable offer, based on the area’s cost of living. You did the cost of living research, you found the salaries to be acceptable, and now you have landed a new job. Congratulations! That joy may be tempered by the daunting task of moving. If you’re a homeowner, you’ll have to get your house listed for sale. No matter what, you’ll have to quickly find a place to rent or buy in your new location. Things get crazy, but a great relocation package means you don’t have to stress yourself financially to accomplish it all. Some companies provide a relocation amount in a flat rate. Others provide a package that tells you what services they provide, with no cap. One package is not necessarily better than the other, but in the negotiation phase, you need to be sure you understand your moving requirements in order to advocate for your needs. If you’re a homeowner, you’ll need to list your home for sale, which isn’t generally an expensive process. However, if you’re in a market where the house is likely to sit for months after you leave, you’ll be on the hook for a mortgage payment on top of your rent or mortgage in your new location. It’s fairly rare, but some employers will offer to buy your home from you. Note that you might be able to make more money if the house sits on the market, but your employer will use comps to provide you a “fair market value” of your home, so they wouldn’t be ripping you off. You can choose to take their offer and not worry about two housing payments, or you can take your chances and sell the home yourself. I have packed myself for long distance moves and I have had packers hired for us. I prefer to pack myself, though that’s a nearly impossible feat if you have small children running around. For our last move, the company required us to use hired packers to insure our belongings during the move. The packers can pack your house in one or two days. They provide all the boxes, tape, bubble wrap, and paper that could possibly be needed. They will mark each box with the room it was packed in. If you’re lucky, they’ll put some additional detail on the outside of the box. Even if you don’t hire packers, you’re going to need a bunch of packing supplies. Depending on the size of your house, this can get expensive quickly, though in the grand scheme of the move, packing supplies are peanuts (pun intended). Professional movers are hands-down the most expensive part of a cross-country move. If your company is paying for the service, there’s no reason to refuse it. If, however, you receive a flat-rate package, you might want to investigate renting a U-haul in order to save money. If you rent a U-haul, you probably have several friends and coworkers who can help you load it. But what happens on the other side? If you have really heavy furniture and no one to help you, you can hire some help for the day, possibly by contacting a local moving company. If you’re moving a long distance, investigate the cost of airfare. You may or may not choose to fly for the move, but if you are leaving a home behind, you might need to fly back to check on it, handle repairs, or to close on the home. If you have small children (or even pets), you might want to opt out of driving cross-country. If nothing else, it takes longer with small children or pets in tow. It’s also way more stressful if you have pent-up energy in your back seat for 4 days. As part of pricing your move, you can consider having your vehicles transported to your new location and then flying to your destination. In some cases, the moving company that moves your household belongings can help with this. However, you can probably find cheaper rates through a dedicated vehicle-moving service. Note that it will take around 2 weeks to have your vehicle delivered to its final destination. In most cases, you will need to book a house hunting trip. After all, you probably don’t know much about the area. You can do research online, but you’ll be much better off if you personally visit rentals. And if you decide to buy, then of course you’ll want to see the home in person. House hunting trips. Flying back to check on the house. Driving cross-country. You’ll be eating out a lot, and eating out is expensive. If you have a flat rate package, you can certainly eat out on the cheap, but it’s still more expensive than eating at home. Be sure to factor in your meals. The thing about professional movers is that your belongings never arrive very quickly. The movers might leave your house on the 15th of the month and not deliver the items to the new place until the 30th. If you have small children, you probably aren’t going to just camp out on the floor for two weeks. You can rent a suite at an extended-stay hotel or you can check into corporate housing options. Both of these are pricey, but worth it. Remember you’re starting your new job during this time. You’ll want a good night’s sleep to start you off on the right foot! If you have pets and opted to fly across the country, then that means Fido and Fluffy have to fly, too. That could mean an additional vet appointment, because you’ll need a bill of health for them. They might also need to be brought up to date on their shots. You’ll need a kennel of some sort. And of course, you’ll need to pay airline fees. One tip: pack scissors in your checked bags. You’ll need them in order to extricate your pet from the kennel post-flight. Note that there are pet moving companies, who will drive Fido or Fluffy across the country for you. They can be extremely pricey! However, if you’re moving during summer, this might be the only way to go. When temperatures are too high, pets will not be allowed to fly under the airplane. If you fly to your new home, you’ll need a rental car until your own car shows up. Expect that to take around 2 weeks! Renting a car for 2 weeks can get very expensive, so if you are offered a flat rate package, you might want to look more closely at public transportation options. Last but not least, if you’re moving across the country, chances are you are going to work for a new company. All of your sick time and vacation accruals will be gone. If possible, negotiate for time off up-front. Those first few months are filled with settling-in tasks like getting your license and your vehicle registration. You’ll do what you can before you start work, but some things will be left hanging out there. You don’t want to find yourself in a position of not getting paid because you didn’t have sufficient time off. A cross-country move can be very expensive if you take advantage of all the options above. Note that many are options you could pass on if you were to move yourself, and if you are only moving a few hours away, you can eliminate many categories. However, if an employer asks you to move for the job, don’t end up footing the entire bill yourself. Negotiate! Have you taken any financial missteps during a cross-country move? Have you ever asked for or negotiated a relocation package? I haven’t been offered such but I think if the offer is worthy of relocation considering its benefits, I’d gladly take the offer. But, this is something we should consider and contemplate on because relocating to another place can be very expensive.